The greatest boxing star in German history is without question Max Schmeling. He beat Jack Sharkey for the vacant Heavyweight Championship in 1930. In 1936, he made a brilliant tactical assessment of a young Joe Louis and knocked out the man who would become one of the greatest heavyweights and pound-for-pound boxers in history. Schmeling’s win over Louis unfortunately made him a darling of the sleeze-bag Nazi regime, much to his own personal dismay. When he rematched Louis in 1938, with World War II coming fast, it would prove to be one of the biggest sporting events in history. Louis pounded Schmeling out in less than a round, to become a national hero in the United States. The Nazis never forgave Schmeling. But Schmeling was a great man. He personally helped a number of Jewish people escape Germany and kept the story a secret for most of his life–it was others who ultimately brought the story out. For Schmeling’s own part, he did not want to be praised for his actions during a time when his nation as a whole had behaved in such a vile manner. So the man is rightly viewed as a hero in Germany–one of the very few they can claim for that villanious era. This Saturday, the biggest German boxing star of this generation will headline a card in Max Schmeling Halle in Berlin. Marco Huck will look to take his WBO cruiserweight title back from the Ukrainian sensation, Oleksandr Usyk. Huck has been the best cruiserweight of the last decade. But Usyk looks to be a next-level talent. The last time I can remember a cruiserweight generatiing as much interest as Usyk was in the 1980s, when Evander Holyfield ruled the division. Holyfield would go on the become an all-time great at heavyweight. Fans are anxious to see what Usyk will do someday in the sport’s glamour division. For now he has a serious challenge in Huck. They share a common opponent Poland’s Krzysztof Glowacki. Huck was knocked out by Glowacki in a back-and-forth war in August 2015. Usyk beat him with ease by unanimous decision in September of last year. The odds are long for Huck in this one. 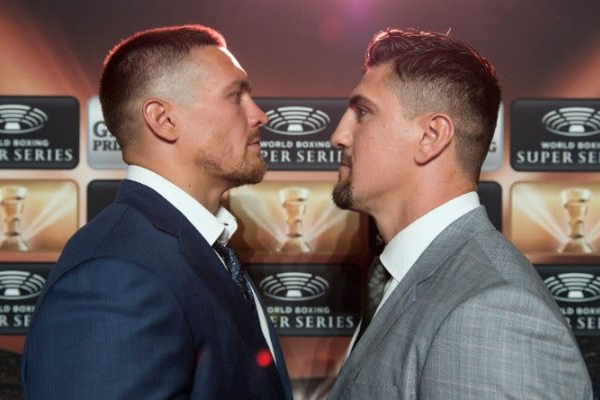 Usyk is a legitimate phenom–he deserves all the hype he is getting, and at cruiserweight, hype is not easy to come by. But do not count out Huck entirely. He is a well-travelled and experienced talent. He is in a position not entirely different from what Schmeling was in back in 1936–a former champion who is being lined up to pad a rising superstar’s record. Maybe the ghost of Old Max will lend him a hand. Against Usyk, he will certainly need all the help he can get.